After Ivy's birthday party, we had a couple of friends from dance come over for a quick photoshoot. My friend, January, has become a representative for Lexi Luu dancewear. 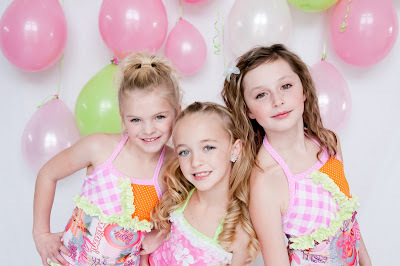 They seriously have adorable clothes and the girls love wearing them to dance and gymnastics. In order to help my friend get her business off the ground, we did the photoshoot and created fliers and a blog to help her advertise. The pictures were an absolute hit and the girls loved pretending to be little models. those are seriously cute dance clothes for kids - where can I find out about them.